MATS 2017 Introduces "Knock Out Bad Regs"
The Mid America Trucking Show is always a great chance to learn about trucking job opportunities and latest features impacting the industry, and this year was no different. The show, which was held March 23- 25 this year in Louisville Kentucky, was full of celebrity appearances and giveaways and, as always, the PKY Truck Beauty Championship drew an impressive crowd, but there were also many exhibitors that offered a plethora of different demonstrations and information revolving around trucking. The Mid America Trucking Show was founded in 1972 in order to show truck drivers, fleet owners, and interested individuals the newest products, a platform to discuss ideas revolving around the industry, and in general enjoy the world of trucking. The event, which draws in over 75,000 attendees every year, is the best attended trucking show in the world. One exhibitor who introduced their new campaign was the Owner Operator Independent Drivers Association, based out of Missouri. The organization told eager listeners at MATS about their “Knock Out Bad Regs” plan. OOIDA, who began their quest to continuously fight for the rights of truckers in 1973, claims that by following the Knock Out Bad Regs plan, members will be able to make sure that current administrators adhere to their plan to reduce the amount of regulations. Currently, there are more than 158,000 members who make up OOIDA across the nation and also in Canada. 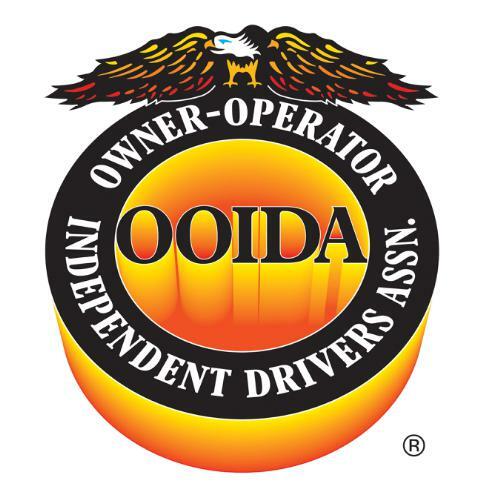 These members operate 240,000 “...individual heavy duty trucks and small truck fleets” and OOIDA claims that their sole purpose is to represent the interests of these drivers throughout any issue that may have an impact on one's truck driving job. More specifically, this could consist of furthering the fair treatment of drivers, guaranteeing highway safety for both semi truck drivers and passenger vehicles, and working towards a better business climate. To accomplish these lofty goals, OOIDA works to promoting their ideas to legislatures and other government agencies on every level of government – from local and state to federal. According to their website, they work with every rule that comes up which could have an impact on drivers, while also being there for hearings involving the industry, and attending many organizations and conferences centered around trucking, like the Mid America Trucking Show. 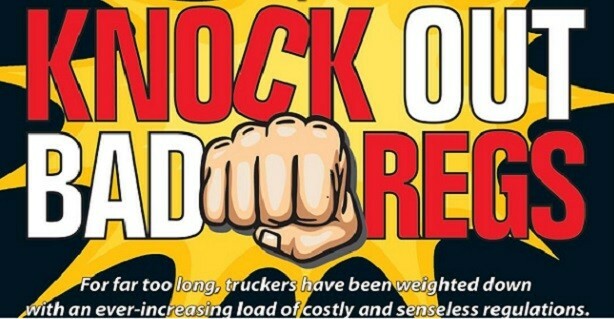 While the Knock out Bad Regs project directs interested people to a website other than the official OOIDA website, they do make a disclaimer saying that the website, www.fightingfortruckers.com, is more of their grassroots effort in order to get more drivers involved and showing how they can help without bogging them down with heavy language and topics and providing a more “call to action” vibe. 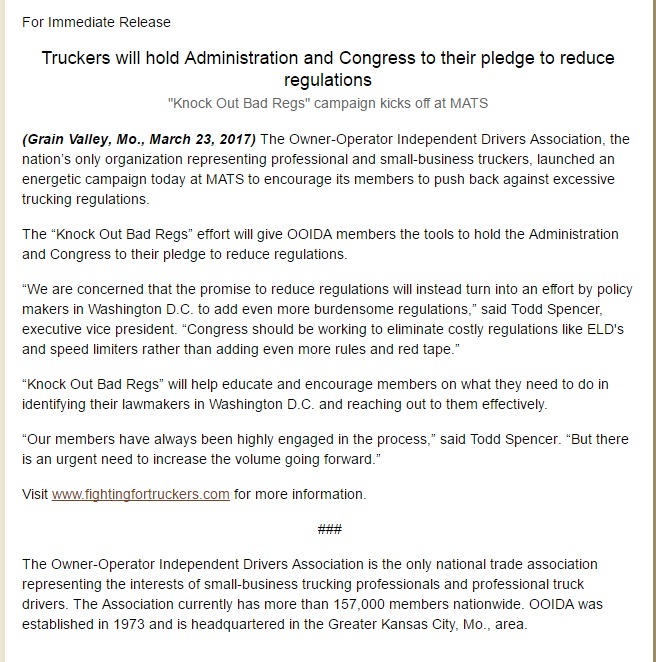 In a press release, executive vice president of OOIDA, Todd Spencer, said, “We are concerned that the promise to reduce regulations will instead turn into an effort by policy makers...to add even more burdensome regulations.” This came out only two days after OOIDA had released another statement on their joint commitment with 16 other organizations to write and send a letter to Department of Transportation Secretary Elaine Chao to not only hold off on the implementation of the quickly approaching electronic logging device (ELD) regulation, but also to repeal it, also to do the same with the possible implementation of a Federal Motor Carrier Safety Administration rule concentrating on truck speed. According to the letter, the OOIDA and other involved members feel that if these regulations are eliminated, it will provide “...substantial regulatory relief...” to many different industries, not only that of trucking. One of the largest reasons they do not want these rules to come to fruition is the fact that both are huge monetary strains on the current economy, which estimates of the ELD rule raking up to an astonishing $2 billion and the speed limiter coming in at a still phenomenal $845 million – just in implementation costs! One of the most interesting aspects of the OOIDA Knock Out Bad Regs campaign is how trucker-oriented they plan on keeping it. Upon visiting the website, truck drivers are invited to take part in an OOIDA survey to let them know which of the current and impending rules and regulations seem most harmful to an individual driver or fleet owner. By conducting this, it keeps a very human side to the OOIDA and shows they are willing to use their efforts to benefit the majority of the industry, not only their own interests. Upon clicking on the survey, the participant is faced with the OOIDA's main objective for conducting the survey, which is to notify the Trump Administration and Congress what regulations are the ten least favorite among people in the trucking industry. Where they admit that there are several things within trucking that need to be fixed, they want to make it certain that those taking the survey knows this focuses only on current regulations and proposed rules. While there are only 14 regulations on the list, the survey also gives participants the option to add in any regulation they feel should be repealed as an option on their list. 14.) Certified Medical Examiner Registry. While the OOIDA does mention quite a few regulations for ranking within the survey, one downfall is that they do not offer even a brief description as to what the regulation would cause meaning that if a driver is not fully aware of what the regulation means and how it impacts the industry, they would have to spend more time looking it up in order to see if that is truly one of the top ten regulations they would like to get rid of. Another way the OOIDA is putting this project into motion is by asking for testimonials from truckers about ways in which these, or any regulations, have had a negative impact on their experience within the industry or one's personal trucker job. Gathering stories from drivers across the country provides an important cross-section of drivers from vastly different states where trucking is prevalent, from rigs in California to drivers battling white line fever in Florida. While this also puts a human face to how regulations affect trucking, the website does not say what the OOIDA plans to do with the stories. One more aspect that shows this is a more grassroots approach to the official OOIDA website and legislation efforts is the fact that the Knock Out Bad Regs project has a special section to help drivers and fleet owners find out how to contact their state representatives directly by just putting in their zip code. 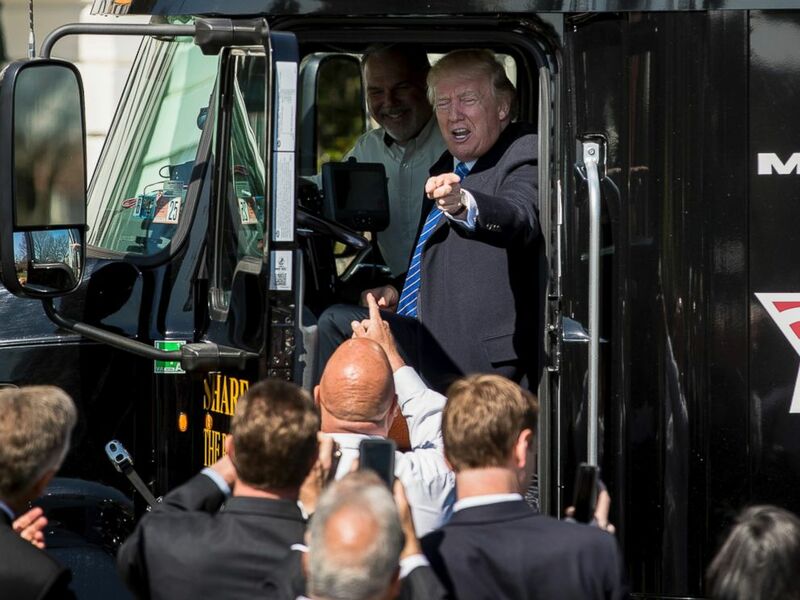 The OOIDA, while listing 14 different regulations to rate for the top ten list, seems primarily concerned with the Trump administration's decisions when it comes to the ELD and speed limiter rules. Aside from cost, the OOIDA argues that the ELD rule will not have any sort of benefits due to the fact that it is unable to detect and record “...changes in a driver's duty status...” and is designed for large fleets rather than independent drivers or smaller fleets. They also argue that because it is supposed to go into law by December, it does not give the technology enough time to be where it needs to be, especially since several of the tested devices still face a plethora of connectivity problems, especially in more rural areas. As for the OOIDA's thoughts on the Speed Limiters rule, they feel that it will lead to an overall increase in crash rates because, “...as extreme speed differentials between automobiles and heavy vehicles make driving conditions more hazardous”. They also include the idea that, especially in areas with already heavy traffic congestion such as Texas, it would become worse because trucks would still be carrying the same amount of cargo. By writing, or more easily calling, senators, representatives, and even governors, it ensures that legislators at least know that there is some sort of opposition, or agreement to be fair, to the regulation. Making this call is easy as one can call the Capitol at (202)-224-3121 and asked to be switched to their corresponding senator or representative by simply giving the operator the zip code of the caller's voting address. Whether or not one agrees with the OOIDA's ideas and ways of going about changing legislation, it does not change the fact that drivers, fleet owners, and anybody involved in the trucking industry should put forth an effort to make their opinions and views of both passed and pending regulations known.